In the 10 years that Jasson Minadakis has been artistic director of Marin Theatre Company, in Mill Valley, Bay Area playgoers have been the fortunate recipients of his efforts to 1) bring us exciting works by up-and-coming playwrights and 2) bring us works that not only include but center on African American characters and themes. Some of the plays, of course, combine the two, such as Matthew Lopez's The Whipping Man (the company's third-best-selling production ever), Danai Gurira's The Convert, and Will Power's Fetch Clay, Make Man--all extremely well done and well reviewed. In addition, MTC has presented two of famed late African American playwright August Wilson's ten plays, set, one in each decade of the 20th century, in his hometown neighborhood, the Hill District of Pittsburgh. 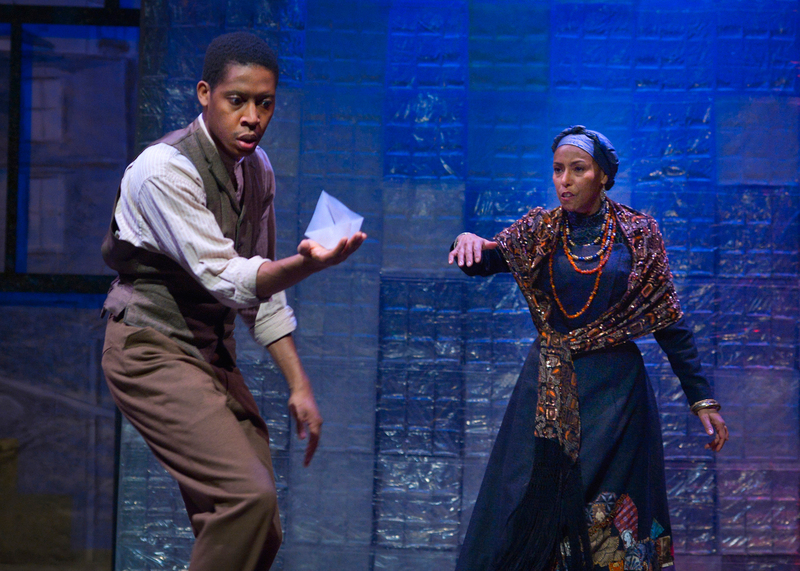 After stellar productions of Seven Guitars in 2011 (the company's tenth-best-selling show) and Fences in 2014, MTC is currently offering Wilson's Gem of the Ocean. Set in 1904, Gem of the Ocean is the first play in Wilson's "Century Cycle" but almost the last to be written and performed (in 2003). It also seems more impressionistic than the other plays, a feeling enhanced by this production. Minadakis and director Daniel Alexander Jones sought to "use the tenets of jazz ensemble playing," as Minadakis explains in the program, in an effort to "loosen the demands of naturalism with Wilson as we often do with Shakespeare." Wilson himself was inspired by the artwork of African American artist Romare Bearden, who is best known for his collage work. (One piece, Mill Hand's Lunch Bucket, directly inspired a more famous Wilson play, Joe Turner's Come and Gone.) As Maddie Gaw points out in the program notes, "Bearden bore witness to the disjointed experience of black Americans, whose culture had been constantly fragmented and reshaped as a consequence of enslavement, anti-black violence, segregation, and mass migration." Gem of the Ocean is no jigsaw puzzle of a play, demanding the audience put the pieces together to gain a coherent whole, but it does reflect and speak to this fragmentation and that list of consequences. Two of the characters are old enough to have been slaves themselves. One, Solly Two Kings (Juney Smith), escaped to Canada and then helped other slaves to get there until, as he points out, Abraham Lincoln made the effort unnecessary. The other, Aunt Ester (Margo Hall), says she has a "long memory," and indeed, we are meant to think she is the keeper of the black experience, past, present, and future. Those curious and close enough to study the embroidery on her skirt will note several faces--such as those of Emmett Till and Oscar Grant--in the intricate design. Each of Wilson's ten plays centers on a key issue for African Americans during that decade. In this play, the question is, after slavery was abolished, what kind of freedom came in its wake and how are African Americans to use it? In a central scene, Aunt Ester takes a young man (Namir Smallwood) on a spiritual trip, aboard the slave ship Gem of the Ocean, to the "city of bones," to help him "cleanse his soul" by experiencing what his ancestors endured. The man's first name is Citizen, and as Solly points out when he hears the name, "You gonna have to fight to get that. And time you get it, you be surprised how heavy it is." One of the many benefits of MTC's quest to present plays by Wilson, Lopez, Gurira, Power, and others, has been the opportunity to watch some terrific African American actors perform. So we've seen the Bay Area's great Margo Hall in both Fences and Seven Guitars, and the less well known but strong actress Omoze Idehenre in Seven Guitars and last season's stunning Convert--as well as a number of outstanding actors who haven't performed here before, such as Smith and Smallwood, who play pivotal roles in Gem of the Ocean. The other fine actors in this Gem include David Everett Moore, Tyee Tilghman, and Marin's own (Caucasian) Patrick Kelly Jones. It tells you something about this company and its audience that the play's run has been extended even before the reviews come in. See it. And if you want to know more about August Wilson and you live in the Bay Area, you're in luck. Thanks to MTC's sponsorship, the excellent American Masters episode "August Wilson: The Ground on Which I Stand," which premiered last February, will air on KQED Plus on Sunday, Feb. 7. Through Feb. 14, Marin Theatre Company, 397 Miller Ave., Mill Valley, 415.388.5208, marintheatre.org. Photograph: Margo Hall sends Namir Smallwood on a spiritual journey via paper slave ship.